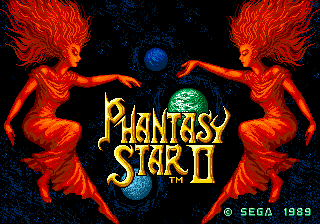 You will need a Genesis emulator to play Phantasy Star II and a PlayStation 2 emulator to play the remake. You can download them from my emulators page. If you need assistance with any of the emulators offered on my site, check out my emulation help subsite: Video Game Emulation for Newbies. The original Sega Genesis/Mega Drive version of Phantasy Star II. This is the North American/Europe version of the game. 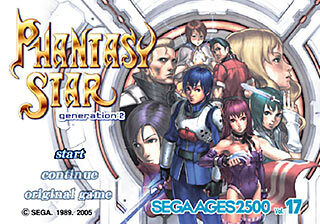 The remake of Phantasy Star II released for the Sony PlayStation 2. This game was not released outside of Japan, but the download I offer here is pre-patched with the unofficial English translation. A variety of hacks that make the original Phantasy Star II easier, harder, fix bugs, or provide a whole new experience! What is “Pre-patched” and ”Patch”? ROM hackers release their works as patches. In order to experience their hacks, you must apply their patch to the original game. With the ”Pre-patched” download, I've saved you the trouble and patched the game for you. But if you insist on patching the game yourself, you can download just the patch with the “Patch” download. I have patching instructions in my patching guide. This easy hack multiplies all experience and meseta gains from battles by 4. Neat, huh? You can fly through the game with this patch! This patch aims to fix bugs and oversights present in the original game, and in addition the game script was revised a little by removing typos, using correct spaces between words and punctuation marks, replacing some poorly translated lines with those taken from the Japanese version, using full names for the planets like the other installments of the series, etc. Besides some windows were enlarged in order to accommodate full words for the entries, like GIVE instead of GIV, or RIGHT instead of RGHT. A very small feature was included for the cursor on the naming window. Apart from these changes, this patch contains no enhancements: it's exactly the same as the original in terms of gameplay and difficulty. Every piece of equipment has had some alteration done to it, from a different strength or opened to use by new characters. There are even many new ones! All the characters learn more Techniques. The guns have been given major improvements to be better than many bladed weapons and some award defensive bonuses. Every shop inventory has been changed. All the enemies give double Experience and double Meseta in comparison to the originals to speed the pace of the game. Each character levels up at a different rate, and the weaker ones get massive boosts from level 35 and up. Brand new monster sprites and a new enemy! This hack builds on top of Numan Revolution (above) by making the game harder! Everything you love about Numan Revolution is in this version. But hell broke loose because there's a 50% increase in difficulty, 4 new enemies, many new monster encounters, and altered monster abilities. Not for the feint of heart! But those ready for challenge, get ready for the Evil Overload! 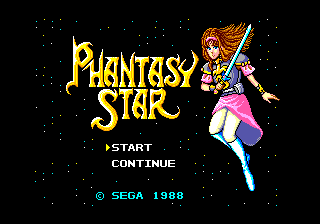 The game that started it all - the first Phantasy Star for the Sega Master System. This is the North American/Europe version of the game. If you want to see how it's like, check out this gameplay footage. 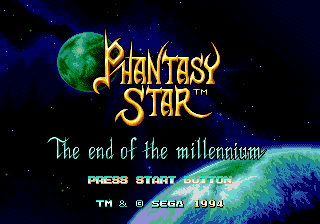 This is the unofficial official fan retranslation of the original Phantasy Star. It includes 2-line naming terminology, narrative formatting, window expansion, replaces the 8×8 font, reworks the name entry screen, and allows FM/PSG switching (press Pause on the title screen). 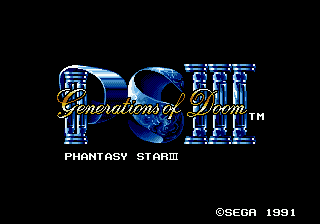 “Phantasy Star III: Generations of Doom” for the Sega Genesis/Mega Drive. This is the North American/Europe version of the game. This is the least popular game in the series. If you want to see how it's like, check out this gameplay footage. “Phantasy Star IV: The End of the Millenium” for the Sega Genesis/Mega Drive. This is the North American version of the game. It's an excellent game; probably the best of the series. I also have this game shrined. 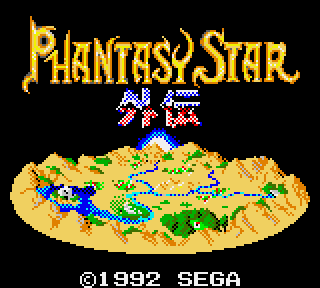 Game Gear's own Phantasy Star title. Its style is similar to that of the original Phantasy Star. This game was not released outside of Japan, but it's available in English thanks to fan translators. If you want to see how it's like, check out this gameplay footage. 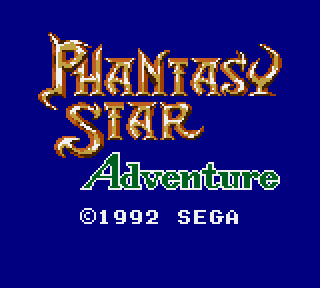 A Phantasy Star text adventure released for Game Gear. The fact that it is not a traditional RPG turned people off, leaving this game obscure and unpopular. It was not released outside of Japan, but it's available in English thanks to fan translators. If you want to see how it's like, check out this gameplay footage. Like Phantasy Star 2? Check out its sequel, Phantasy Star 4!